Are you worried that your child is showing signs of a learning disability? Are you looking for detailed information on learning disability? Want to help your child to cope with the condition. Want to support your child physically and emotionally to overcome this disability. Then read this article to learn about learning disability in children and how to help the child to overcome his/her learning disability. Learning disability is a disorder of neurological weakness, which affects children, the ability of writing, reading, speaking, comprehending the things, analyzing facts and figure, remembering and thinking. 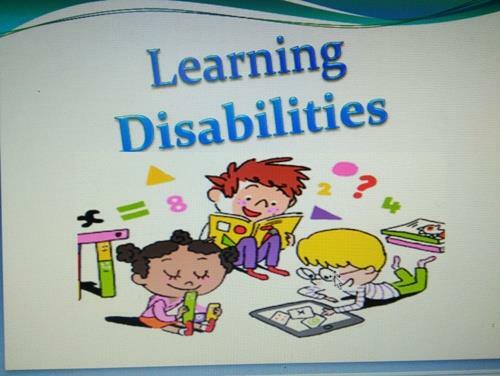 Learning disability is not mental retardation, emotional problems or has anything to do with the child's intelligence. The disability in learning cannot be cured; it is a lifelong problem, learning disabilities are lifelong problem With proper support and help the children with the learning disability can be made to understand their weaknesses and strengths and encourage them to achieve success their lives. Learning disability is not a disease that can be cured, with proper learning mechanisms the child's learning abilities can be improved to become successful in life. There are different kinds of learning difficulties, it can be in the form of language difficulty, dyspraxia or attention skills disorders affecting the coordination. The most common learning disability being reading disorder Dyslexia(DRD), where the child has an inability to express the ideas in written form or has difficulty in comprehending the written words. Children with learning difficulties have to work hard to cope with the issues, as they are at a disadvantage throughout their lives. Children with learning problems find it difficult to process information, though they may be intelligent. Most of the learning difficulties are found to originate in the early developing stages of the embryo. The abnormality in the structure of the brain results in not processing the information properly. One of the causes found to be is when there is reduced oxygen supply to the embryo in the womb or during the birth. Different kinds of information are processed on different pathways in the brain. When there is a deprivation of oxygen, the development of the brain may be temporarily arrested resulting in this learning disability. Genetic factors in the family may also be passed on to the children. Learning disorders are found to be hereditary. Scientists claim that certain genetic inheritance pattern produces certain specific dysfunction of the brain which takes several forms. Learning difficulties are found to occur due to toxins/drugs taken during pregnancy. These drugs may affect the developing brain in the child directly or indirectly which results in the dysfunction of the brain. Toxins in the environment are also found be one of the causes of learning disabilities. Children living in areas of high concentration of lead pollution are found to have learning difficulties. Poor Concentration: The children with learning disabilities has short span of attention. They have wavering attention, cannot concentrate on the work they do and are unable to complete the task in the given time period, they get distracted very fast and disturb others. Low grasping power: These children cannot grasp things fast, have difficulty in understanding the concepts compared to other children. They face problem in picking up the concepts of time, space, formulas etc. Poor Coordination of motor skills: Children with LD experience difficulty in writing, drawing, coping from the board, are not organized, show clumsiness in their way of presenting the things. Forgetfulness: Children find problems in memorizing and remembering, cannot remember basic information/ details of their personal details, family information details. They cannot recollect what they have learnt. Children fill our lives with happiness, hopes and dreams. Each child is different with a unique personality of their own. Some children are bright in all the subjects and are quick to grasp. Some are good in some subjects, such as languages, some are very quick in solving puzzles and mathematical problems; some are good at art and sports. But the child's performances are based on our education system, which does not allow the children to choose merely one /two subjects to study and pass. Children need to pass in all the prescribed subjects to get the degrees and certificates. In our schooling system, the child needs to perform well in all the subjects. All children do learn at the same speed/ or by the same methods of learning. Some children grasp fast, some may take time, they may need repetition of the concepts again and again, some may not be able to learn at all. Parents are in a dilemma when they learn that their precious little one is not performing well in the academics. They spend sleepless nights, and become desperate to understand the child's makeup- whether the child intelligent/ incompetent/ lazy/not interested/unable to grasp things. When your child is not performing well in academics or has difficulty in keeping pace with the learning, then you need to become alert, become aware that your child has a problem with learning. Gather courage, accept that your child needs special attention, and try to act positively, to enable the child for joyful learning. When the child is showing the signs of learning difficulties, parents need to understand that they have to provide emotional support, provide the child with positive strokes, help the child to develop the skills in her/him, at their pace. They never should compare the child with others, instead encourage the child to learn with interest. Parents need to understand that, this condition is common and that could be resolved with timely treatment and remedial measures from the concerned specialists to overcome the disorder. Children need unconditional support and attention from the parents to overcome these learning difficulties. One should not label the child as lazy or underestimate him/her on the basis of academics only. The child may require extra care and special methods/techniques to perform well in academics. The highly intelligent child may find strategies and work hard to achieve results, their gifted talents may be overlooked. Many celebrities, leaders, great personalities and entrepreneurs had learning disabilities but had overcome and become successful in their lives. Ex-president of USA, Bill Clinton, scientist Albert Einstein, entrepreneur Bill Gates, actor Orlando Bloom, filmmaker Steven Spielberg, singer and actor Cher, entrepreneur billionaire Richard Branson, actors Abhishek Bachchan, Hrithik Roshan have gone through the tormenting learning disabilities. Learning disability in children can be present in varied ways and find it frustrating in the learning process. Early intervention would help to resolve the learning issues. Once the child is identified with learning disabilities, the child should be investigated, counselling to be done and the extent of disability to be known. Learning disabled children may not be retarded but be near average intelligence. These children face difficulties in the usage of language and also in comprehending the contexts. They may not show steadiness in their academic studies. The factors that contribute to this condition need to be assessed be it social, environmental, emotional, physical, scholastic etc. Discuss with the special educators for learning programs to be adopted for the child. A child who has learning disabilities should be given hearing and sight tests, and investigate for the defects in sensory organs, and the extent to which the disorders are affecting the child. Provide the child with good healthy food to keep the child in good health free from any ailments. Interact with the child in the learning process, help the child to speak and write. Help the child to build inner strength to face issues surrounding them. The learning can be assessed with varied tests and assignments. The child's language skills can be tested by interacting with the child. Reasoning and computational skills can be tested using reflective questionnaire. Reading and spelling can be done by dictating and listening to audio clips. Speed and handwriting testing can also be using this method. The mathematics involved the practice tests/constructed tests. Learning disability in children presents a major challenge for parents to deal with. However, with continued efforts, support and help from them will enable the children to overcome the disability with confidence. Using proper strategies/techniques will foster the development of the skills in the required areas of learning and makes way for the holistic development of the child's personality. Interact with the educators, seek their help, consult other parents who have a child with disabilities, exchange information, suggestions etc. Update yourself with the latest information on the disorder. Parenting the child with learning disabilities is an enormous task, tedious and tiring. Allow yourself for some relaxation, distress yourself, comfort yourself and provide best possible help and support for your child to grow beautifully strong individual physically and emotionally.